Successfully Added Magic Cell Phone Holder - Nano-Micro-Suction Technology, Easy To Use And Clean, 360-Degree Rotation, Suitable For All Phones to your Shopping Cart. With this magic cell phone holder your smartphone will always be within reach while in the car. Simply attach this smartphone holder to your car heating vent with its clip, and you’ll be all set to attach your smartphone and hold it in place without any further installation processes. Perfect for those of you that wish to use their smartphone’s GPS features whilst on the move, or to entertain your passengers with in-car entertainment – with this non-magnetic smartphone holder your cell phone is always within reach. Thanks to its simple clip, this smartphone holder features an easy to use and plug and play design due to which it can be attached to any car vent in a split second. Featuring state of the art micro-suction technology, it works without the use of any magnets – guaranteeing that it can be used safely without damaging your electronic devices. With its strong absorption, this micro smartphone holder can be used as many times as you wish and is capable of holding large and heavy sized smartphones without you needing to fear of it dropping down whilst driving. 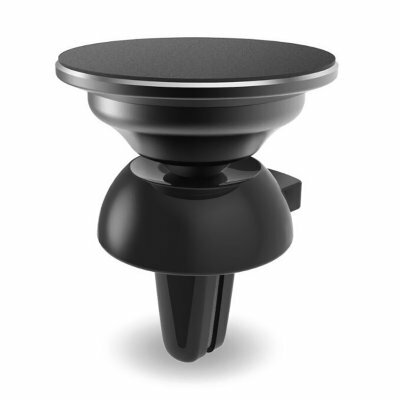 Attach your smartphone to your dashboard and enjoy your phone’s GPS features or allow your passengers to watch a movie on your smartphone while waiting to reach the upcoming destination – with the magic cell phone holder your options will be limitless. Supporting 360-degree rotation, you can be assured that you and your passengers can always enjoy the best possible viewing angle no matter where in the car they are sitting. With its stylish, lightweight, and highly portable design – this car cell phone holder can be easily carried around and attached to any car vent system out there.